Hildesheim / Frankfurt - „High-quality products and projects [...] which are all pioneering for the German and international design landscape" will be decorated with the German Design Award. The expert jury of the German Design Council has now decided that the AutoGyro Cavalon is surely one of these outstanding products. One year after the gyroplane "made in Hildesheim" has been honored with the red dot design award, AutoGyro is filled with pride about this new, important award. "It is a very special appreciation of our work and our visions and fills us with great pride." 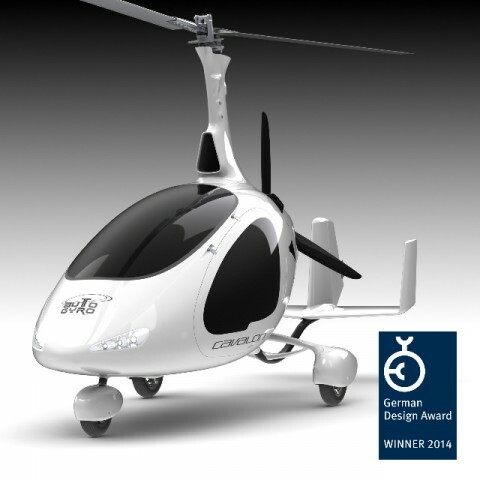 Otmar Birkner, CEO of the AutoGyro GmbH, knows about the scope of this award. "Being honored by such a council shows that we really are on the right track." The Cavalon is the youngest model by the gyroplane manufacture from Hildesheim, Germany, and is being produced since 2011. With its side-by-side seating arrangement AutoGyro bursts old limits and gives room for luxury and comfort within the world of ultra-light aircrafts. With equipment options such as air conditioning, heated Alcantara leather seats or integrated tablets within the customized cockpits, AutoGyro sets new benchmarks. But also the design of this aircraft is unique. It was created by Otmar Birkner and features even the smallest details with ingenuities which are both, visually and technically well thought-through. The German Design Council has the same opinion and decorated the AutoGyro Cavalon with the title "Winner".